3.Check out the Strava KOM! Possibly the most painful 5 minutes of your life. An ascent of one of Scotland's most infamous hills..Logie Kirk. Steep, twisty, sometimes slippy, it's sure to test even the best hillclimbers. As usual We will have cash prizes for each of the senior categories in addition to seperate prize funds for each of the youth categories. As Scottish National Hill Climb, the race will attach many big name riders in Scotland. Come along, find a space on the hill, whip out your cow bell and cheer them on! Thanks for all the support from the following business and bodies. 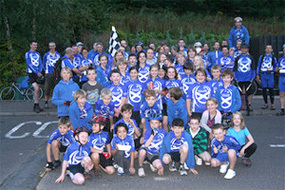 SBC is Stirling's largest cycle club, catering for all disciplines including road, mountain, and track. SBC also has a junior section called the Wallace Warriors. Both the main club and the Wallace Warriors hold regular rides and training sessions that can be seen on our website. If you fancy coming along on a club ride to see if SBC is right for you, you will be warmly welcomed.